"Green smoothies?! What in the world is that, and what good can it do me?" If you find yourself asking yourself that, don’t worry, you’re not alone. Even though I have been drinking homemade smoothies for most of my life, I only very recently learned about this special type of fruit shakes. Like many people these days, you are probably trying to improve your nutrition and health. You likely hear nutrition advice that says to eat more vegetables, especially leafy green vegetables. You've heard that same advice repeated many times, but still struggle to implement it in your own busy life. Like most health advice, it's easier said than done, right? Let’s start with the easiest healthy eating option: salad. You hear all the nutrition advice and vow to eat more salads. So you make yourself a big salad with lots of vegetables and other yummy ingredients. Maybe you enjoy it the first day. What If You Can't Stand Eating Salads? You eat exclusively cooked vegetables, like broccoli and carrots. ...OR you add so many extra calories that it ends up being no healthier than a hamburger. If so, you are not alone. I was there for a long time, struggling to make myself like salads. Although I know a few people who manage to do it, the truth is, most people just aren’t cut out to sit down and eat a huge bowl of spinach as their main meal each day. The good news is, there IS another way, and it’s actually so much easier and more delicious too! New Wisdom: Drink Your Salad! We all know salads are good for us because of all the green leafy vegetables. But how do we make them actually taste good so we can stomach large quantities to get all the benefits of greens? Without drowning it in extra fat calories, or the other pitfalls mentioned above? The solution? Drink your salads. With green smoothies, you get the nutrition benefits of salad, without it tasting like salad, and it actually tastes really good. Leafy Greens – This is the magic ingredient we all need more of, the star of the show. Packed with vitamins and minerals, they help improve heart health and prevent heart disease and cancer. Fruit – True superfoods, fruits are packed with antioxidants and vitamins. They also infuse the smoothie with natural sweetness, so you don’t even notice the taste of the greens. Water – While you can use soymilk, almond milk or juice, “true” green revolution smoothies use water as a liquid base. This is so the emphasis is on the raw foods in the smoothie, and to avoid adding processed ingredients. It’s also very easy, and free! Other Superfoods (Optional) – You only really need the above 3 ingredients. So simple, right? But after experimenting with the 3 base ingredients, it’s totally fine to add other ingredients, like protein powder, chia seeds or other powders, say if you’re an athlete. Feel free to get creative! Greens have SO MANY health benefits (to be fully explored later on this website). The problem is, it’s hard for our bodies to properly digest enough leafy greens in solid forms, which is why liquifying them is such a great option. And believe it or not, it's actually a lot faster to make a green fruit shake than a big green salad, once you get the hang of it. So these smoothies are the perfect solution to squeeze plenty of raw greens into your hectic lifestyle. 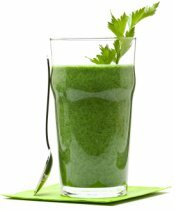 The basic idea is that by drinking at least one green drink per day, you can dramatically increase your health by getting more whole, unprocessed raw foods (fruits and leafy green vegetables). At the same time, you reduce your cravings for ‘bad’ foods (processed junk food). It’s a win-win situation. If you’re looking for an easy way to eat healthy, boost your energy, and feel generally happier and more vibrant most of the time, this raw green drink just might be your answer! 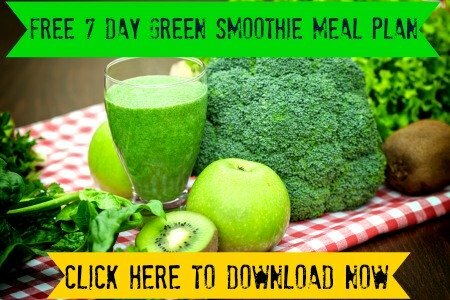 I recently learned the amazing power of green fruit shakes and soon made most of my daily smoothie recipes green! I hope by now you’re ready to at least give green smoothies a try, and witness the benefits for yourself! The BEST way to get started with green drinks is with a 7 day challenge. Click here for a complete 7-day smoothie plan. The smoothie plan is 100% free. Not only does it come with a different smoothie recipe for each day of the week....it also comes with a grocery shopping checklist for the week and printable recipe cards. Everything you need to get started, no excuses! So get started now here. Or click here to browse this page full of green recipes for inspiration first.